Vaitheeswaran Koil Temple: Vaitheeswaran koil is the Hindu temple dedicated to Lord Shiva, which is located near to Chidambaram town in the state of Tamil Nadu. In this Temple main Deity is Lord Shiva who is called as Vaitheeswaran, who posses healing properties. Devotee’s belief is that by praying to the Vaitheeswaran “God of Medicines” can cure the skin diseases. And this temple is dedicated to Angaraka (Mars). Details about Vaitheeswaran Koil, Tamil nadu Info, Darshan Temple Timing, Temple Photos, Temple History, Lord Pooja Details given below. As per the Hindu mythology, once the planet mars (Angaraka) got a deadly disease and worried. He was told by unnamed voice to visit the temple at Vaitheeswaran Temple. When he visited here his disease was cured by lord Shiva. 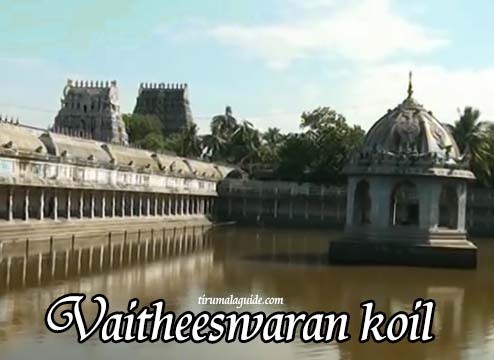 So the lord here was called as Vaitheeswaran. Devotees take a holy dip in the temple tank before worshiping the deity in the temple. And the local belief is that is that dissolving the jiggery in the water cures skin diseases. The holy soil rounded by the ash is treated as medicine and believed to cure the diseases. Another medicine is given that chandan which is mixing of sandal wood and saffron. Besides that, pepper and salt with jiggery are offered in the Siddamritam to get rid of diseases. In morning Darshan will open from 6:00 A.M to 1:00 P.M. The Temple will be closed at 1:00 P.M for cleaning garbha gruha. Again the Darshan will starts at 4:00 P.M to 9:00 P.M in evening. The mentioned timings will change during Festive days. Accommodation for the pilgrims is that there are many hotels and lodges near to the temple and room charges vary between Rs. 200 to Rs. 1000/- per day. Online booking facility is also available for private accommodation. Tuesdays are preferred to worship angaraka. One worship of angaraka here, by fasting for 2 Tuesdays, the unlucky influence of Tuesdays will be cleared. How to reach Vaitheeswaran Koil, Tamil nadu? This temple is located in between Srikazhi and Mayiladurai in the route of Chidambaram and Mayiladurai. Frequent bus services are operated by Tamil Nadu government. No direct buses are operated to Vaitheeswaran koil from Chennai. Vaitheeswaran koil to chidambaram bus service are available. The nearest railway station is Mayiladuturai; direct trains are available from Chennai, Bangalore and Madurai.